Since it's November, we're officially done with Halloween bentos for awhile. Just a wee bit thankful for that as I was starting to run out of ideas for innovative Halloween bentos! I asked Ben what he might like today and he requested Peanut the elephant. I'm not entirely surprised, the boy still loves his elephants! i really like that elephant cutter! so cute. And the pumpkin choc chip bread looks delicious. 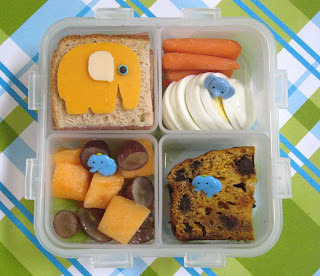 Aw, this is so cute, so many elephants in the bento! Very cute. Can I ask what type of container that is? Do the inner parts come out...it looks like a perfect container...available in Canada??? @Kim, it's a Lock & Lock container. I believe you can order them on Amazon. I actually got mine at Target, but several years ago. I haven't seen them instore in ages, and I'd love a second one.